Home Page › Explanations › A Tasbih Consist of ? Stoppers (duraks) and Disks: In the 99-bead Islamic version, the tasbih consists of duraks ( stoppers) two different shaped beads put at each 1/3 of the chain, marking each 33 beads: these are called “durak” (stoppers) and not counted in the number of beads. 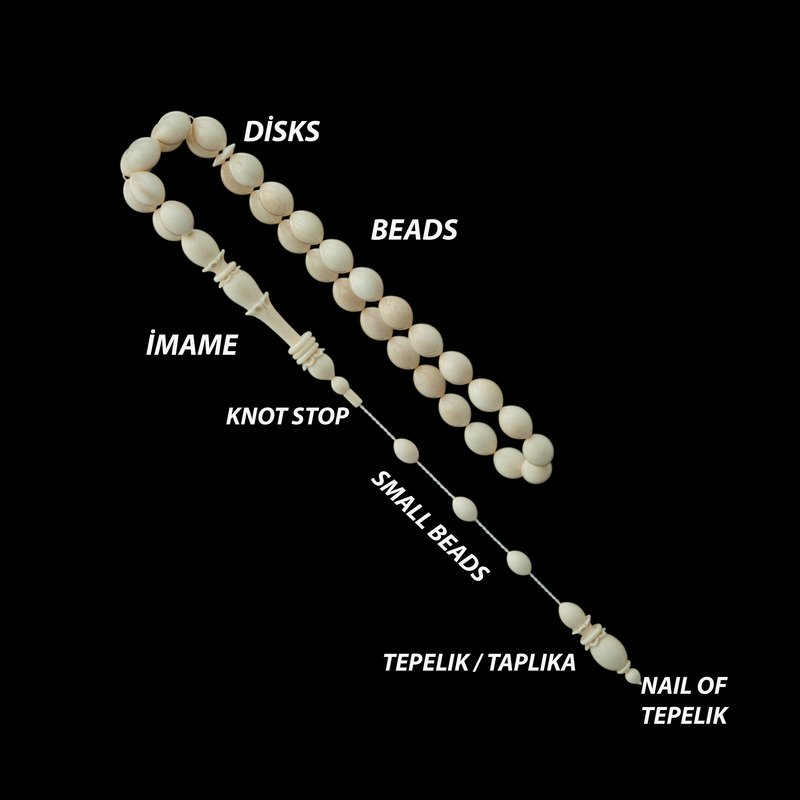 In the 33 beads tasbih , a disc the pul (discs) , a tiny bead marking the fifth position. Usually marking 5th position , sometimes you could see that it marks 7th and 11th. They usually put disc after 5th bead as a signification of Ehl-i Beyt (family of Prophet Mohammed S.A.V) and five Pillars of Islam. Imame : The long piece marking the beginning of the string is called “imame” (pronounced ee-mameh). It is the most important element of the tasbih. To making the elegant imame; lenght of imame should be between 4 and 6 beads lenght according to Turkish masters . It is Golden Ratio for Turkish masters. Knot Stop : The piece right after imame. It prevents imame from moving upwards. Tepelik / Taplika : The tepelik at the extremity of the imame. All these pieces must also match with each other. ** To see content properly , adobeshockwave is needed.